Of all the reasons to remember John F. Kennedy on the 50th anniversary of his death, here’s one that neither his fans nor his detractors appreciate fully enough, because it was so secret for so long: The man was a pharmaceutical miracle, with his own speed connection on the Upper East Side. Jacobson, born in 1900, studied medicine in Berlin and fled Nazi Germany in 1936. He had a lifelong interest in treating multiple sclerosis, but he made his name developing booster shots for healthy patients, first among other European émigrés, then in New York’s theatrical community, and eventually in Hollywood and Washington. Sloshing and mixing amphetamines, vitamins, enzymes, tranquilizers, placenta, and anything else that inspired him into what he called an “IV Special,” the charismatic Jacobson came up with concoctions to pump up stressed-out celebrities. Otto Preminger, Truman Capote, Tennessee Williams, Alan Jay Lerner, Eddie Fisher, Anthony Quinn — they all saw him. Dr. Max. Jacobson’s devotees came to his practice throughout the day and night, sometimes mistakenly breaking into nearby offices to search for drugs, and he not only shot them up, he taught them how to inject themselves and prescribed them needles. “Maybe they will destroy me but they make me see life in a good light,” Lerner told his wife Michelene about Jacobson’s treatments, according to testimony she gave at their 1965 separation trial. JFK met Jacobson through Chuck Spalding, an old Harvard friend, at Dr. Max’s New York office in the autumn of 1960, just before the Kennedy-Nixon debates. Kennedy instantly impressed Jacobson: “He made me feel that whatever I said was very meaningful and all-important was my advice,” Jacobson wrote in a memoir that he never published. (Ruth Jacobson, Max’s widow, shared this memoir with me in 1990, when I was conducting research for Richard Reeves’s book President Kennedy: Profile of Power.) JFK was feeling the effects of constant campaigning: He was tired, his back hurt and was getting worse, and the fatigue and pain were affecting his concentration and speech. Jacobson sized up his new patient and gave Kennedy one “treatment” that instantly made him feel stronger and very alert. And after that, Jacobson was like Zelig in Camelot. “You won’t have that for an excuse,” Jacobson replied, as he fixed the leader of the free world. Later, because he spoke German, Jacobson was given the task of finding a replacement for Jacqueline Kennedy’s malfunctioning hair-dryer. Jacobson stayed on call for Kennedy. The White House would contact his office using the code name “Mrs. Dunn,” and Jacobson would travel to D.C. or Hyannisport or Palm Beach, usually on a twin-engine Cessna owned and piloted by Mark Shaw, a patient who was also a photographer who frequently shot the Kennedy family. Gate logs show Jacobson visited the White House more than 30 times in 1961 and 1962, to see both the president and the First Lady. “Moments of glamor intermingled with moments of crisis in the White House,” Jacobson wrote, and he had that right. Dr. Max was there to jack his speed-laced cocktails into Kennedy whether the president needed extra energy to sit through a Pablo Casals concert or deal with Soviet missiles in Cuba. And he enjoyed an amicable relationship with JFK, who laughed at his Jewish jokes. Jacobson’s widow even said she was “99.5 percent certain” that Max had coined the phrase “Ich bin ein Berliner” for Kennedy (though that’s about 99.5 percent certain to be untrue). But the Secret Service was suspicious of Jacobson. “He was the bat wing and chicken blood doctor,” agent Larry Newman told Seymour Hersh. Robert Kennedy was, too. FBI files show that the Attorney General sent a bottle of Jacobson’s magic elixir to the bureau for analysis in June 1962 (though there wasn’t enough material left to study). “I don’t care if it’s horse piss,” the president replied to the criticism, according to Jacobson. “It’s the only thing that works.” That captures Kennedy’s response to his medical agonies, and to most of life’s challenges: He was reckless, courageous, pragmatic, and fatalistic all at once. Eventually, though, JFK’s reliance on Jacobson incurred the wrath of his other physicians. We’ll never know exactly what was in the shots Miracle Max gave the president. Jacobson apparently destroyed his files after Kennedy’s assassination, and it’s a long shot that he kept careful records, anyway. But we do know what Hans Kraus, JFK’s New York–based orthopedic surgeon, told Kennedy in December 1962: “No president with his finger on the red button has any business taking stuff like that.” If there are any heroes from the Kennedy Administration left unsung 50 years later, they are Kraus, who actually threatened to expose the JFK-Jacobson relationship if Kennedy kept taking Dr. Max’s injections, and Admiral George Burkley, Kennedy’s official government doctor, who worked with Kraus to get Kennedy off powerful painkillers and into exercising his back muscles. 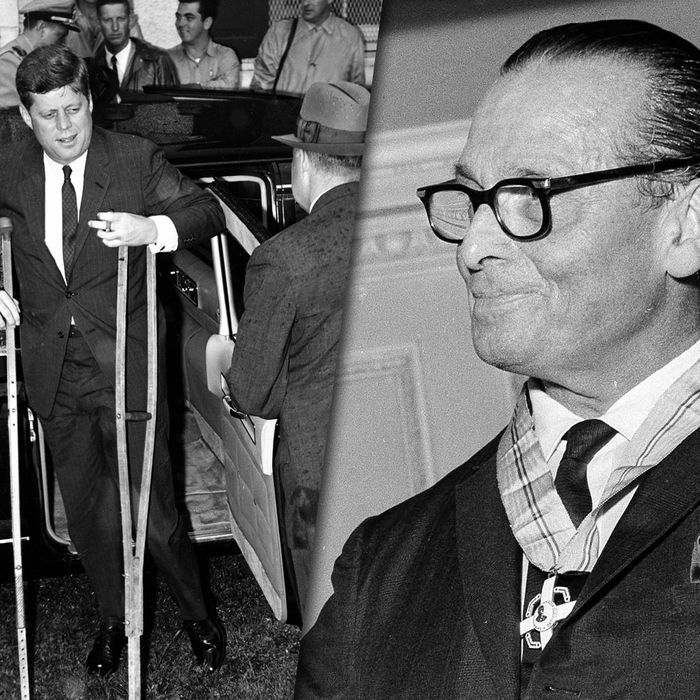 Because of their work, the sad truth about JFK’s assassination is that Kennedy was probably in the best health he had ever been in on the day he died. Jacobson has gained some notoriety recently from a bio called Dr. Feelgood: The True Story of Doctor Max Jacobson and How He Changed History by Manipulating President John Kennedy, Marilyn Monroe, Elvis, and Other Key Figures of the Twentieth Century, a title that tells you all you need to know about the book. That’s too bad, because Jacobson’s real story is interesting, and sordid, enough. (Documentarian Martin Kasindorf has done an interesting job of telling it in Everybody Went to Max: Remembering ‘Dr. Feelgood,’ the Merlin of Kennedy’s Camelot.) When New York’s Bureau of Narcotics and Dangerous Drugs visited Jacobson in 1968 and again in 1969, he couldn’t account for the drugs he had on hand, and agents seized his controlled substances; during the second visit, they noticed he had needle marks on his arms. In 1969, Shaw died of acute amphetamine poisoning. In 1972, the Times published a massive front-page story on Jacobson, complete with reports of Dr. Max hooking patients on speed, mixing injectable potions without formulas or notes, and bragging that he had treated the Kennedys. He lost his medical license in 1975, and died four years later. On May 28, 1973, Jacobson’s memoir reports that he got a call from Spalding, who had first introduced him to JFK more than dozen years earlier, and who said he urgently needed to meet. The next day, at Spalding’s apartment, Dr. Max was surprised to find Jacqueline Onassis waiting for him. Jacobson’s first hearing before the panel reviewing his license would be in two days, and she wanted to know what he would say if asked about the White House. He assured her “there was no reason for concern.” He also mentioned that, while he had never taken money from JFK, he was now concerned about the hearings, and that he had already spent $35,000 on legal fees. She replied, “You don’t have anything to worry about,” according to Jacobson. On their way out, Spalding told Dr. Max that help was on the way, and suggested Jacobson’s foundation ask Jackie for a contribution.